Beatboxing genius Beardyman headlines Soundcrash at KOKO! The 2x times UK Beatboxing Champion’s live shows see the bearded one create music live in front of the audience with the help of his mouth and a enviable collection of gadgetry that would make any music geek drool. Expect plenty of audience participation, quality tunes, and if we’re lucky we may even get to play drum’n’bass musical statues. Hobnobs will be confiscated upon entry. 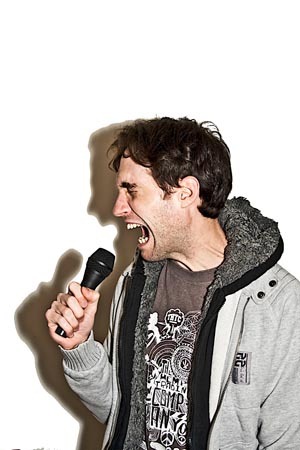 Beardyman has come a long way since winning the UK beatbox championships TWICE in 2006 & 2007 (in 2008 he was the judge) and since his internet viral Kitchen Diaries was shown on the Ellen Degeneres show in the USA in 2007 it has now accumulated over 5 million plays across YouTube (with the total views of all of his clips in the high tens of millions) and his skills bagged him a headliner slot next to Katy Perry at the first ever YouTube LIVE concert, in 2008. She may have kissed a girl, but Beardyman created the buzz for the whole event and got to second base by helping YTL make history by receiving the most ever views online, ever, at one sitting. Damn, and if that ain’t enough, Beardy’s live music mash-ups have graced the main stages at Sonar, Bestival, Lovebox, Snowbombing and Rise festivals and supported the likes of Groove Armada, Jazzy Jeff and the Beastie Boys. All this from a guy who wrote a symphony for his school orchestra aged TEN. Saturday 22 September 9pm-3am KOKO – London… 1A Camden High Street, London, NW1 7JE. Delicious Vinyl, the label that released Cali rap crew The Pharcyde’s groundbreaking 1992 debut album Bizarre Ride II The Pharcyde (quoted as Kanye West’s favorite album), has released a three-CD box set featuring instrumentals and remixes to commemorate its 20-year anniversary. Original members Fatlip and Slimkid3 have also re-joined forces with Bizarre Ride producers J-Sw!ft and L.A. Jay for Bizarre Ride Live, a series of shows where they perform the entire album, blurring the lines between a straight up hip-hop show and a theatrical performance, Bizarre Ride Live includes all the original skits and interludes from the record, and even some special surprise guests (“did somebody page Quinton??”). No details are missed out as renowned graffiti artist SLICK, who designed the album’s cover, art-directs the stage and live audio-visuals are taken care of by L.A. Jay. Expect animated hip-hop, energetic raps, bright colors, b-boy throw-downs, magnetic visuals, a heavy dose of humour, and absolutely everything in between. After a sell-out premiere at The Roxy Theatre in Los Angeles on May 23rd, Bizarre Ride Live is gearing up to tour the U.S. and Europe through the rest of 2012, starting with an August 3 date at Low End Theory in San Francisco, CA and an in-store August 4 at Amoeba Records in Berkeley. Dropout UK caught up with UK rapper Fem Fel who delivered a Dropout Demo freestyle for them orientated around sunshine, ironically on a gloomy day! On Friday 17th August Evil Twin Records will be bringing you 20 years of classic UK & US Hip Hop! ✰ A Proper Throwback Hip Hop event! On the night they will be offering a limited number of first come first serve places to ANY local MC who wants to showcase their lyrical talent to a packed club full of proper Hip Hop heads! ✰ Each MC will be given 15 Minutes performance time! ✰ Places will be determined ON THE NIGHT!!! Badlands, Silver Street, Bedford……Doors Open From 22.00 – 03.00am Strictly 18+ Identification Will Be Needed Upon Entry Dress Like You Have Made An Effort!!! Snapbacks & Box Fresh Trainers Allowed!!! ✰ For More Information Contact The Following…..
Skratch Bastid & The Gaff cutting up 4 Freda Payne 45s to recreate JVC FORCE’s “Strong Island” beat. Taken from a practice session for their “Soul Sisters, Stand Up!” live show & recorded mix. Check the mix over here: http://www.skratchbastid.com/?p=2605 – 80 mins of 100% female funk/soul/r&b/breaks.